Rice, 1. The scheme of reception of fluorogram: 1 - source of x-rays; 2 - the object of scanning; 3 - x-ray screen with screening bars; 4 - optical system of the camera; 5 - film (fluorogram). Fluorography (synonym: radiophotography, rentgenoterapii, roentgenofluorescent)is the method of roentgenologic examination, which consists in taking photographs, x-ray image of the investigated object with translucent screen on the film. In Fig. 1 presents the scheme of reception of fluorogram. Because x-ray photography x-ray shadow image produced by the photographic optics (lens or zerkalnaya optics), fluoroscopic image compared with x-ray is presented in varying degrees reduced. All designs photofluorographic depending on the size of fluorogram divided into two types: malacatoya (malacatoya) and krupnokadrovaya. To malokakhovs include photofluorographic giving size fluorographic frame that fits the size of the imaging standard film. 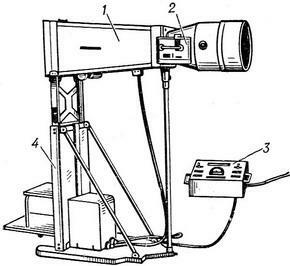 To such photofluorographic include domestic photofluorograph FCF-1, running on perforated tape with a frame size of 24x24 mm, and modernized in 1955 photofluorograph f-55 (Fig. 2)working on non-perforated tape with the frame size 32x32 mm Manufactured since 1956 photofluorograph f-59p (Fig. 3) with zerkalnaya optics designed for macroframe fluorography with a frame size of 60X 60 mm and provides as one fluorogram in the cassette and series LMS on roll film. Fig. 2. Malacatoya photofluorograph f-55: 1 - tube; 2 - the camera; 3 - pools control; 4 - a tripod. Fig. 3. Krupnokadrovaya photofluorograph f-59: 1 - tube-chamber; 2 - control cassette; 3 - remote control; 4 - a tripod with a lift. In connection with the reduced size of the frame resolution fluorogram (i.e., the appearance of small parts) less than conventional x-rays, but higher than the image on a translucent screen. But as constructive improvements photofluorographic (improvement of resolving the optical system, the use of screening lattices, improving the quality of translucent screens), as well as sensitization, i.e. increase the sensitivity of the film to the glow of the screen, and enlargement of frame sizes up to 100x100 mm fluorography approaching on the diagnostic value to conventional radiography. The main advantages of fluorography method of roentgenologic examination - high bandwidth at low cost of time for each study, the opportunity to bring the survey to the population, economy, relatively small professional harmfulness. 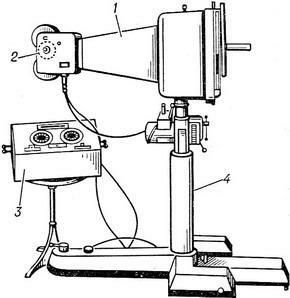 In the years of the great Patriotic war krupnokadrovaya fluorography with a frame size of 65x90 mm was used for mass x-ray examinations of the injured with firearms and traumatic injuries of bones and joints, and also to clarify the localization of foreign tel. In peacetime fluorography is used mainly for regular annual survey of the so-called compulsory contingents: workers of food industry, food stores and shops, public catering, hairdressers, conductors urban transport, students and pupils of schools, technical colleges and schools (12 years), persons of military age. The rest of the population should be examined once in two years. Along with stationary fluorographic treatments in treatment-and-prophylactic institutions (clinics, TB clinics, medical organizations) are mobile cabinets for fluorography, mounted in the bus, train and tram cars (see X-ray room). Mobile cabinets for fluoro allow examination of workers, students and pupils at the place of work or study. Mobile classrooms are also used for examination of rural population in collective farms, state farms, field camps. Fluorographic examinations require a clear organization of the entire process fluorography. The most important successive stages fluorographic work are the following. 1. Preliminary sanitary-educational work among eligible for screening contingents, having to explain the objectives of the study. 2. Careful consideration of all the persons subject to examination, and planned organization of work, providing 100% coverage of persons subject to the screening. 3. Continuous shooting, providing of technically high-quality LMS skilled further research, identify and account for all persons who during the screening detected certain pathological changes. 4. A thorough and complete examination of all without exception of persons who have at fluoro detected or suspected pathological changes. 5. Direction every person diagnosed by a respective medical channels.